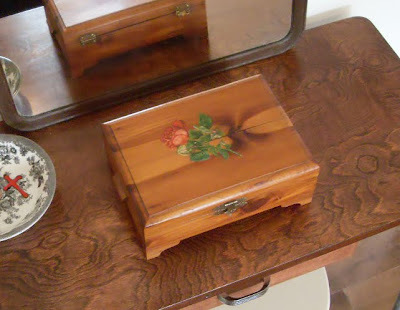 I have been working on getting my vanity table set up, so this weekend I carefully wrapped my little jewelry box and brought it home from my parents' house. It is over 85 years old and was originally my great-grandmother's. My great-aunt Leona (Onie, as we call her) gave it to me on the day of my wedding shower in 2006. I think it is beautiful -- it is something that would catch my eye if I saw it in an antique store -- and I am extremely honored to be its current owner. 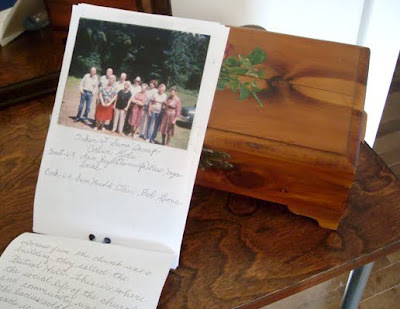 Aunt Onie also put together a 10-page booklet that tells the box's story, written in the shaky scrawl that she and my grandfather, her brother, shared -- a product of their crippling rheumatoid arthritis, the disease that took him home to the Lord two Decembers ago. Toward the end, the words get harder and harder to read as her twisted hand got more and more tired from writing. The booklet fits perfectly inside the box, where it will stay until I give it to a daughter or niece someday. I started to type out what the booklet said, but it suddenly felt too personal to share it all. I may share it someday... or maybe not. In essence it talks about how the box, along with a Bible, was a special gift to my great-grandmother from her oldest children. Throughout the years it held wedding rings, homemade hankies, little booties filled with spare change (dimes on sunny days, nickels on rainy days) to give to the church, brooches my great uncle Hoot brought back from WWII and more. It is the sweetest story about the older generations of my family, told from the box's perspective. The last paragraph reads, "When Leona received the invitation to your bridal shower, she gave it much thought and decided you, Katie, would be the perfect home for me. I did not object, nor would I have wanted to. So, goodbye Leona, hello Katie. 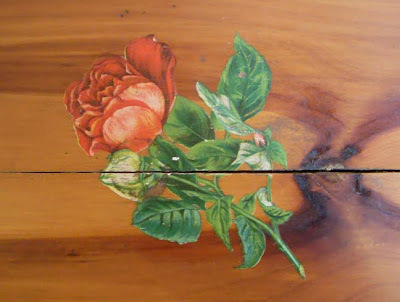 Love, the little cedar box with the rose on top." If that doesn't melt your heart, then I don't know what will. I don't have much expensive jewelry for anyone to steal, but I'm pretty sure I'd rather lose all the jewelry than the box itself. We don't have a lot of heirlooms from my mom's side of the family, so this is pretty special. 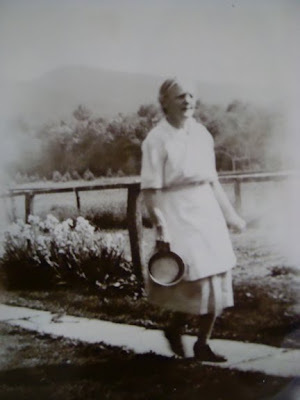 I am hoping it will impart to me a bit of the feisty spirit that my grandfather and his 11 siblings were known for. Most of them have passed on now, but I am sure they are in heaven, arguing boisterously but good-naturedly with one another and singing hymns, very loud and very off key, just like at the family reunions. such a gift. Very few women your age give a "Hoot" about old things, and even fewer men your age. I have a trunk sized tool box made by my Grandfather. In it are many of the hand tools he used while he built barges that floated on the White River in indiana. (1901 +/-) None of my children care for them, none show an interest in family history. They are interested in Wii's, iPod's and lap tops. So what is to become of the family roots? To whom do I give the simple things that mean so much to me? Why do I care so much? Ok, you need not answer all that, I'm just saying. It's a nice box, and even nicer that you have the history. Hey Emily --- Don't you just love things like this? Just as the previous commenter said, lots of young people don't care about family heirlooms, so we're a rare breed I guess. 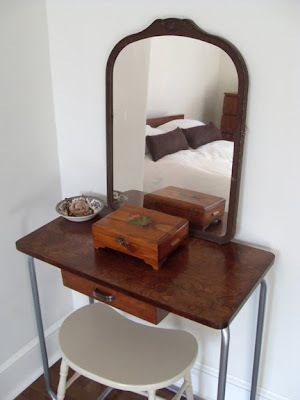 :) Love how your vanity is coming along. Wow. LOVE THIS. So amazing that you have something you can pass down to your children one day. And that they'll cherish it just as much as you. I would take something old over something new any day. And add the family history... just wow.